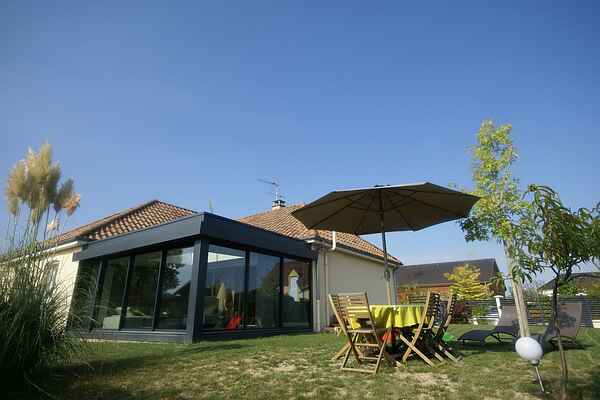 This modern house is located in a village in the Champagne-Ardenne, just 10 minutes drive from Troyes. It is situated in a quiet street so you can enjoy peace, but everything is close! The interior is luxurious and comfortable, everything is there. In the enclosed garden you can relax with a book on the sunbeds before stabbing the barbecue while the children play on the playground. Everything is on one floor, except the garage (4 places) is situated below the house. Pont Ste Marie (2 km) is a nice bakery and supermarket. Creney (4 km) you can go for the larger supermarket. When Outlet McArthur Glen, (2 km) you can shop all day: design and high discounts clothes. At the end of the street begin hiking through the woods. The surroundings are perfect for cycling: fairly flat and the 'voie verte' is near: a landscaped bike path through nature. The lake 'Lac du Foret d' Orient 'is a fifteen minute drive. Here's a nice beach where you can spend the day, or rent a boat or canoe. Obviously can not miss a visit to the charming, historic Troyes. And taste champagne at one of the many champagne houses in the area. Cheers!